MIAMI, FL — August 28, 2018 — Obstetrician and gynecologist Alejandra Salazar, M.D., has joined Baptist Health Medical Group, a network of primary care doctors and specialists who provide high-quality medical care to patients of all ages. Dr. Salazar provides obstetrics and gynecology care to women through all stages of life, from adolescence through the postmenopausal years. She specializes in preventive care, general gynecological evaluation and all aspects of reproductive health, including family planning, infertility, pregnancy, childbirth and menopause. Dr. Salazar is affiliated with South Miami Hospital and will see patients at Women’s Health of South Miami, located at 6141 Sunset Drive, Suite 401. 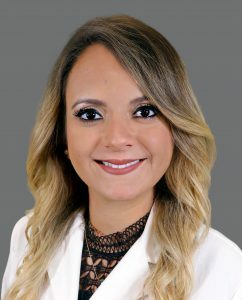 Dr. Salazar earned her medical degree at University of Miami Miller School of Medicine in Miami, Fla. She completed a residency in obstetrics and gynecology at Jackson Memorial Hospital, University of Miami Miller School of Medicine. Dr. Salazar contributes to research in her specialty and has presented her findings at medical symposiums. She is a junior fellow of the American College of Obstetrics and Gynecology. She has been recognized for her academic and clinical excellence. For more than seven years, Dr. Salazar served as a Department of Community Service (DOCS) volunteer, providing primary care, screenings and women’s health care to populations with limited access to preventive medicine and wellness services. Baptist Health Medical Group, a network of primary care doctors and specialists who provide high quality medical care to patients of all ages, is part of Baptist Health South Florida, the largest healthcare organization in the region, with ten hospitals (Baptist Hospital, Baptist Children’s Hospital, Bethesda Hospital East, Bethesda Hospital West, Doctors Hospital, Fishermen’s Community Hospital, Homestead Hospital, Mariners Hospital, South Miami Hospital and West Kendall Baptist Hospital), more than 40 physician practices, 50 outpatient and urgent care facilities, Baptist Health Medical Group, Baptist Health Quality Network and internationally renowned centers of excellence spanning across Monroe, Miami-Dade, Broward and Palm Beach counties. A not-for-profit organization supported by philanthropy and committed to our faith-based charitable mission of medical excellence, Baptist Health has approximately 18,500 employees and more than 3,000 affiliated physicians. Baptist Health South Florida has been recognized by Fortune as one of the 100 Best Companies to Work For in America and by Ethisphere as one of the World’s Most Ethical Companies. For more information, visit BaptistHealth.net/newsroom and connect with us on Facebook at facebook.com/BaptistHealthSF and on Twitter and Instagram @BaptistHealthSF.